For their forthcoming July issue, W magazine's West Coast editor Kevin West looks at how Tehran’s wealthy Jewish community came to settle in Beverly Hills, and naturally, issues of opulence and so-called Persian Palaces come up. Two architects/builders in Beverly Hills, Hamid Omrani, and Hamid Gabbay, are interviewed for the story, and one gets some insight into why Beverly Hills looks the way it does. “When I came to Beverly Hills, there was not any architecture,” Omrani, tells the magazine. “There were old houses belonging to the World War I or World War II era. These were not buildings that had good material or good architecture. So I said, ‘Why should I match with them?’” Additionally, the establishment of a 2004 commisison to oversee design standards in Beverly Hills was "thinly veiled prejudice," according to Omrani. Meanwhile, Gabbay, whose work is more understated (check out some of his work here) isn't a fan of the term Persian Palace because the style “has nothing to do with Persian architecture. 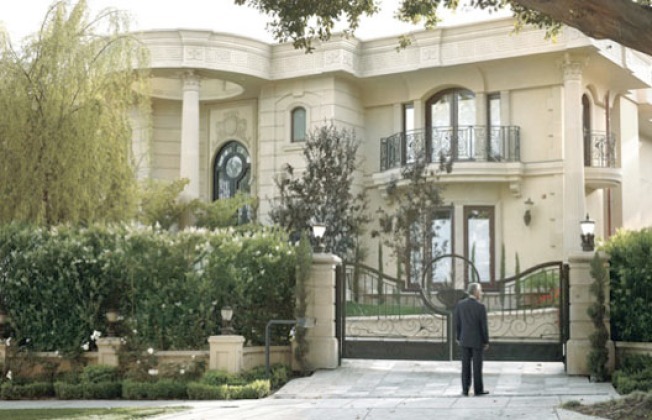 I never saw anything like it in Tehran.” One thing that is changing: According to the magazine"many younger members of the Persian community favor a less ornate style..." The magazine online photo spread also has some inside shots of SBE Entertainment Sam Nazarian's home, still available for $18.95 million.